The house is a newly built beach house on wonderful and serene Manda Island beach, facing the village of Shela. The outside patio is the perfect place to watch the sunrise with a healthy breakfast served by the house's excellent staff. 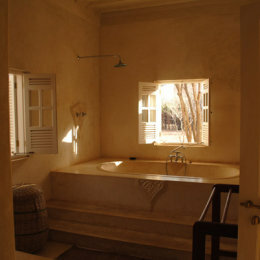 The home is one of the most unique in the Lamu Archipelago. The colonial inspired home features a stunning courtyard design with a spacious open air garden and a number of lounging areas excellent for families and romantic getaways. Shaded under a large Baobab, La Marelle offers direct access to Manda Beach and beautiful ocean views. La Marelle has 3 bedrooms suitable for groups of 2 to 6 in 2 master rooms with bathroom and 1 smaller room with a shared bathroom. Parasols and stretchers are available for the beach. The house comes with a staff of 4: one house boy for shopping, preparing breakfast and serving the guests. One to clean and make the beds, a night watchman, and a captain for the Kinyika, a lovely wooden boat that is at the guests disposal for all transports and excursions around the island. Fuel is extra for day trips away from Shela and Manda. 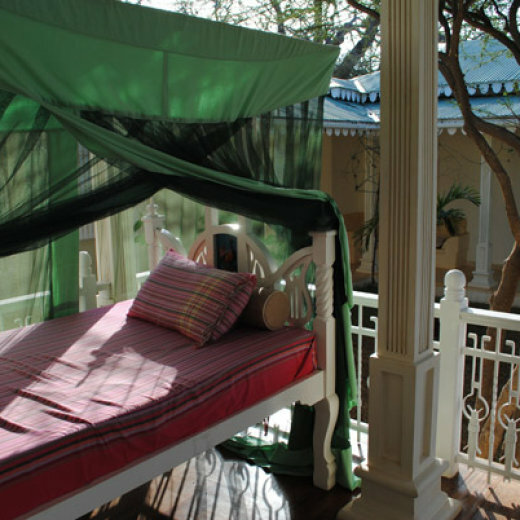 The house has a well-equipped kitchen, large oceanview porch, garden with Baobab and spacious living rooms and lounge areas. Just to say many thanks for the rent of your villa last week. We had a fabulous time and Jeremia, William and Ahmed looked after us very well.